But leaving bodies behind and being seen by janitors is clearly a big no-no in his family and daddy gives him, Eldon, a stern talking to in front of his brothers and cousins for leaving bodies around, tut-tut. The eye removing thing is a family tradition. He’s got to fix his little mistake which involves cleaning up his little problem and hunting down the Winchesters since they killed his brother, Jacob and took their evil book of evil - so this would be the Styne family. They are businessmen, have evil-books of evil, keep it in the family AND like to collect eyes. For trying to play intra-family politics, his cousin Eli also gets his knuckles wrapped for failing to hunt down Charlie. He tries to cover up this ridiculous decision with Dean who has, conveniently, decided to investigate the Stynes in case they come calling again. Dean’s also found the case of the missing eyed woman and men jumping out of tall windows - since he’s still looking for distractions from the Mark of Cain. Sam decides to share his terrible plan of terribleness with Charlie. He wants her to help Rowena because the book is not only in an ancient language but also in code. Charlie points out how this is the worst idea in the world ever - but of course she agrees. Rowena and Charlie aren’t the biggest fan of each other. Castiel also drops in and an angel being around makes even Rowena hesitate. He’s there to keep an eye on Rowena and ensure she plays nice since Angel, generally, beats everything (though Castiel does resent the idea that Sam doesn’t have time to referee but he does - leaving Sam to briefly beg). Like Charlie, Castiel is also very much against doing all this without telling Dean - secret between the brothers never end well. Of course they still all agree - Castiel, Sam and Charlie all nobly declaring “for Dean” (and Rowena throwing in a “I barely know the man” because she may be evil but she’s also kind of awesome). Castiel also brings pork rinds. This is proof he may be evil. Rowena trying to find similarity with Charlie also leads to a lot of excellent eye-expressions between Charlie and Castiel. Rowena then lays out several very compelling similarities between them. She’s also trying to undermine her loyalty to the Winchesters. Crowley also hears his mother has gone missing and gets all stabby with his messengers over it. And decides to interrogate mousey-witch Olivette about Rowena’s secrets. Back to the eyeball scooping investigation and Dean and Sam realise that eyeball scooping Eldon is a Styne (look, secret evil societies, families or other sinister organisations - matching tattoos are a terrible idea!). Another thing the Stynes fail at - cover up. Really, stabbing people to death AFTER the Winchesters have spoken to them only tells the Winchesters you’re in town. Still knowing the Stynes are around makes Dean real happy they burned the evil book of evil, right Sam? And yes the Mark of Cain is still working it’s evil way but it helps to have something to focus on. The Styne cousins interrupt Dean’s pizza run. Bad idea, even with super strength. 1 dead, 1 captured. Dean goes to have words with his brother. While distracted, Styne escapes by cutting off his own arm. Now we know the ridiculous convoluted reason for Sam and Dean deciding to only chain up one arm (c’mon writers, that’s shoddy). Since Dean can’t chase down a man with a gushing arterial wound, he has his little conversation with Sam. Dean is very very angry and Sam even seems a little afraid of him. Which is when Castiel calls to say Charlie is gone. Not the news you want when Dean is wearing is “someone’s going to hurt for this” face. Well, her laptop screen anyway. Seriously, there’s no way that data isn’t recoverable. Dean and Sam arrive. And find Charlie’s body. AAAAAAAAAAAARGH!!! I knew it! I knew that Charlie appearing more than once a season for her rarely scheduled “hey look, women and LGBT people exist!” token wave at the cameras was a bad sign! 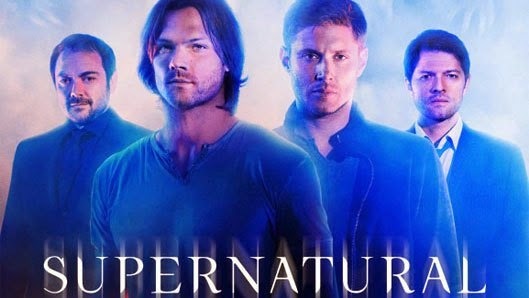 This show does not need another woman fridged for the Winchester’s endless damn manpain! This show does not need another LGBT corpse, even if she WASN’T reduced to a comic relief for once. Even worse it happened in an episode full of some of the shoddiest writing the series has produced. Why did Sam and Dean only decide to chain up ONE hand? This was a guy Dean intended to torture - he’s going to leave a hand free? Just so he can escape and still have a limb left to kill Charlie with. And how does the blood trail just “disappear”? How can Dean not catch up with a man who is losing all the blood? And Charlie “oh hey, Rowena’s a nuisance, let’s pretend bad guys aren’t hunting this information and go off on my lonesome to a motel! YAY!” (remember she asked for help because the Steyns were chasing her AND the opening scene showed they were STILL LOOKING) . And when she told the Winchesters where she was, they got in a car and drove. Hey what a shame they didn’t have a super powerful supernatural being able to move across entire continents in the blink of an eye and kill any human with a single touch? Oh, hey there Castiel! How’s that angel thing working out for you? I want undead Charlie. C’mon Supernatural trying returning ONE person from the dead who isn’t a straight white guy. The Styne evil speech - oh please. The Winchesters have fought Lillith, Michael and Lucifer himself. They have repeatedly duelled - and had drinks with - the King of Hell. They have fought and killed Archangels, Leviathan, survived Purgatory, combatted Metatron, the Voice of God and more than I can even remember. Sure I actually appreciate a season where we’re not facing a big epic force that can end the world - but that doesn’t mean we need to forget that the Winchesters have faced these forces. I also wonder how they kept any secrets when they’re so eager to exposition. It’s not that these guys couldn’t be an interesting antagonist for the next season - in a less world dominating fashion and in a more sinister, underhand, many-expendable-parts level. But I think they need to emphasise that- sneaky, numerous and expendable over epic power. I also, as we have said repeatedly before, despise the implication that major events, especially atrocities, in history were caused by supernatural means (and it’s hella skeevy to link 9/11, recession, stock market dive and Arab spring together).